First U.S. edition – Very Good to Near Fine book that is soft at spine ends, pulled away from page block top of spine, touch of age yellowing to pages, with previous owner name to front end page; in a Very Good jacket that has light edge and corner wear, slight wrinkling at spine ends, mild rubbing, touch of sun fade to spine, and age yellowing along edges. Leo Harting vanishes with secret files; Investigator Alan Turner is sent to find him. 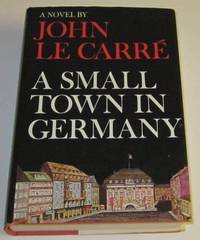 Le Carre's fifth novel.